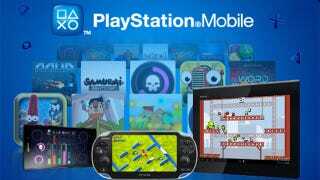 Sony's mobile gaming push goes live today, making the PlayStation Vita much more attractive and justifying the purchase of PlayStation Certified Android devices with 21 bite-sized games. Let's see what's in store! Rolling out across Japan, the United States, Canada, United Kingdom, France, Germany, Italy, Spain, and Australia today, PlayStation Mobile is a platform that brings the sort of games you'd find on the iPhone to the Vita. For PS-Certified Android device owners (see here for a list of devices) it's an infusion of fresh material such as Super Crate Box, Samurai Beatdown and FuturLabs' Beats Slider — fun, quirky and musical goodness. Want a full list? Here we go. Everybody's Arcade Sony Computer Entertainment Inc.
Once purchased each game can be installed on up to three devices. Vita owners will find a PlayStation Mobile tab in the PlayStation Store. Certified device owners will need to download a free dedicated PlayStation Mobile for Android app. I've got an Xperia phone on loan, so as soon as I can grab the app I'll be poking about to see what's what in PlayStation Mobile.